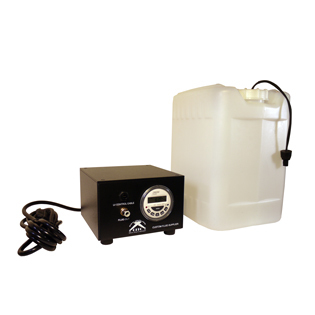 CITC’s new Infinity™ Fluid Supplier allows you to safely maintain fluid levels in your bubble, snow, fog, haze or other effects machine. It is a revolutionary new product using a timer and float switch system to refill an included 2½ gallon container from a 55 gallon drum or other fluid source. You can supply fluid for days, weeks or even months without the labor of having to manually fill every few hours. A low-voltage cable runs from the container switch to the pump unit to prevent overfill. Use the electronic timer to schedule the days and hours of the refilling periods automatically! For water-based fluids only.